Warner to finally go Blu-ray-only at CES? If you prefer your DVR with no strings attached, your choices are pretty limited these days. You can of course roll your own, but admittedly, that isn't for everyone. Channel Master does plan to change that, though, as it's currently accepting pre-orders for its over-the-air DVR with over-the-top features that doesn't require a subscription. The Channel Master TV ($399) should be hitting retailers and homes this week, and since we love DVRs, especially when they're free from commitments, we decided to take it for a spin. Click through to see how it stacks up. This is not an area where the $399 Channel Master TV shines. We wouldn't go as far as saying it feels cheap, but it isn't the best looking (or feeling) hardware we've ever touched. In fact, it's on par with many other media streamers we've used. The box is small, light and mostly made of plastic. It has a single physical button up front for power with a few touch sensitive ones for the rare time when one needs to navigating an on-screen menu without a remote. At 320GB, the internal hard drive is larger than most provider's DVRs. The built in 802.11N will come in handy for most most since network drops aren't exactly common place behind TVs. And dual tuners are pretty standard these days -- the single coax inputs limits it to either ATSC or QAM, not both at the same time. The inclusion of an eSATA port makes for easy expansion, if 320GB just isn't big enough for all your shows. Finally, the included remote is back-lit and somewhat serviceable, and although it's programable, we don't foresee you ditching your Harmony for it. The Channel Master TV is definitely what we'd describe as a DVR first and a media streamer second. The menus and guide are serviceable but nothing we'd write home about. The standard grid guide is there, but so is the spoiler window. The guide indicates what's going to be recorded as well as what's on in HD, but only displays six channels and two hours, and there aren't any optional views. Unlike many provider DVRs, you can remove channels you won't watch from view, which will also filter the search results. Speaking of which, the search is quick and we really like how it grays out letters, like a GPS, to help you quickly find shows. That great search isn't exactly included, though, as the real guide data will run you $50 per year, per box -- ATSC or clear QAM -- and of course does require a network connection. Without the Premium Program Guide, you are stuck with PSIP data which at best is two days worth of information, assuming it is actually present and accurate. Recording a show after you've found something worthy by browsing or searching the guide is pretty easy thanks to recording defaults. In fact you can schedule a recording with a single press of the record button; but two presses does not automatically schedule a series recording. Another feature that is appreciated, but not on every DVR, is the ability to record extra time before or after a show. Playing back content isn't quite as good, though. For starters, there aren't many options when it comes to sorting recordings and you aren't able to break shows out of their folders. Worse even, is that while the show names are displayed, the episode titles are not, making an entire season look like much of the same. The scrub bar is also nothing special, only showing the current time of the show and not how long the show is. Overall, the trick play and responsiveness of channels changes is on par with what we're used to, but there were a few times when the box would get laggy and once it even locked up, requiring a reboot -- we kept the cabinet where it lived open after that. One thing sports fans won't appreciate is the single live buffer that can make it more difficult to switch back and forth between two live programs without missing a play. One of the most compelling features of the Chanel Master TV is the merging of a traditional DVR with modern streaming services. 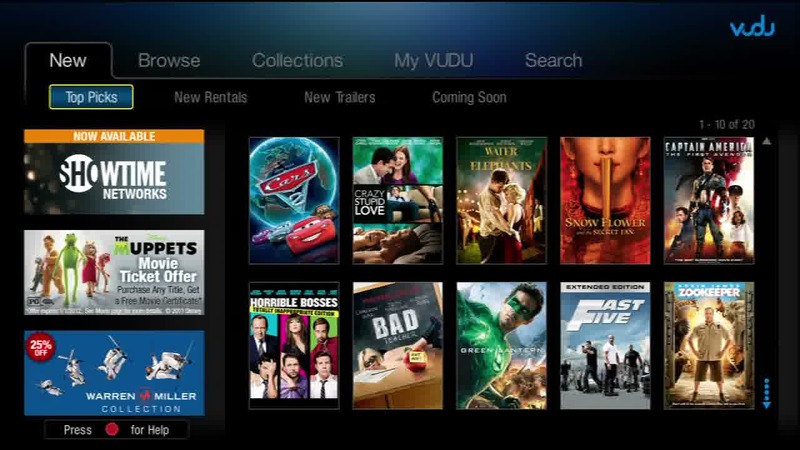 The headliner here is of course Vudu and its portfolio of Vudu Apps. As HD snobs, we've always been impressed with Vudu and its Blu-ray comparable video and audio quality, but many would prefer to not pay per view. The problem is that Vudu Apps themselves have never been that compelling and many of the other services you might hope for are missing-in-action. Netflix, Hulu, ESPN3? No, no and no. The list of over-the-top services that other streamers offers, that the Channel Master TV does not, is long and compelling, but then again the list of DVRs with Vudu built-in is exactly one. We did reach out to Channel Master and they told us "we are working diligently to add more streaming content partners," and that it is the company's goal "to have several other content options." The lack of other services isn't the only problem, however. The other big concern is the lack of integration between Vudu and the DVR. You'd think that by buying one box that did both, you'd get an integrated experience, but you'd think wrong. There's no unified search, and a few little annoyances make it worse, like the guide button on the remote doesn't work when you are in Vudu. The live TV buffer doesn't even build while you're watching a Vudu movie. Sure, you still have one less box under the TV, but if you already own a Blu-ray player or game console with Vudu, the benefit of having it also built into the Channel Master TV is nada. There's no doubt in our mind that the future of TV is a mix between live and on-demand programming. And since we love free over-the-air HD and the quality and selection of Vudu, this is a great combination. Then again, at $399 the hardware and specs aren't looking that appealing when you compare it to picking up your provider's DVR and a sub $99 Blu-ray player with Vudu. But that really isn't the point. This is directed at cord-cutters and the lack of a cable bill will make it easy to save $400 in about six months time. The Channel Master TV does have a long way to go to being a cord-cutter's dream, though, but with the promise to roll out new advanced features in the future, it does have the potential to be just the right fit for those who want a DVR, sans the strings, and aren't willing to roll their own.